Born in Coatesville, Pennsylvania in 1885, Isabel Branson entered the Philadelphia School of Design for Women in 1902, where her teachers were Elliott Daingerfield and Henry B. Snell. The school’s “Alumnae Award,” which Cartwright won in 1906, allowed her to study abroad for one year. She chose to work under the dynamic figure painter Frank Brangwyn in London, but traveled through Holland, France, and Italy. In addition, she was one of Snell’s students in Bruges. The painter married John Reagan Cartwright in November of 1911; the couple moved to Terrell, Texas, where Isabel lived until her husband’s death in 1917. Cartwright later had one-woman shows in San Antonio and Fort Worth, Texas. One critic noted how Cartwright had “absorbed the bright colors of the [Texas] landscape. . . . She found herself avoiding dark shadows and . . . she has come somewhat to specialize in out-of-door portraiture ([Philadelphia] Public Ledger, 11 February 1923). After the period in Texas, Cartwright lived in Philadelphia. In 1917 she joined the Philadelphia Ten, remaining a member until 1945, when the group disbanded. This association of professional women artists had just been organized. Their shows, which often included painterly, rugged landscapes, surprised prejudiced critics who had expected to see only “sentimental pictures” and mother and child themes. Cartwright traveled widely: one of her favorite painting spots was Monhegan Island, off the coast of Maine, where she had a house by the early 1940s. Garden by the Sea was painted in 1934 on Monhegan Island in the garden of Mr. and Mrs. Starr Pierce. 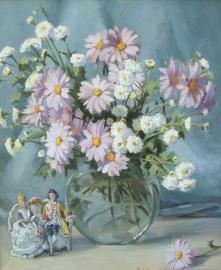 A writer in the Christian Science Monitor (31 March 1934) noted how Cartwright “finds flowers, as they grow in the garden, more interesting to paint than the conventional still-life arrangement.” She exhibited at the Pennsylvania Academy of the Fine Arts (1921-1943), at the National Academy of Design (1922-1934), with the Philadelphia Ten, and with the National Association of Women Painters and Sculptors. In 1953, Cartwright moved to California, to live with her sister Laura and to be involved in the artists’ colony at Carmel. She died in Ross, California in 1966. Written by Michael Preston Worley, PhD.